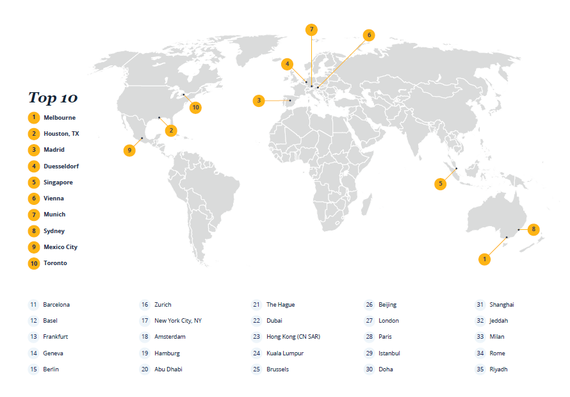 Melbourne, Houston, and Madrid top the list of the best cities to live abroad in previously unreleased data from the third annual InterNations Expat Insider 2016 survey. With more than 14,000 respondents, it is one of the most extensive studies ever conducted to explore the general living situation of expatriates. The top five is rounded out by Duesseldorf and Singapore. The latest InterNations survey found that Melbourne is the best city for people living abroad. Vienna tops the charts when it comes to the quality of life, but Beijing is the place to go for those concerned with personal finance. The survey results show that Berlin is the best place for expats when it comes to the cost of living, but Mexico City is the friendliest destination. As part of the Expat Insider 2016 survey, InterNations takes a closer look at cities around the world and ranks them according to such factors as the quality of life, personal finance, working abroad, and settling in. Melbourne takes the top spot for expat life out of the 35 cities analyzed. Expats in Australia's second-most populous city are particularly pleased with their work-life balance: 79 percent of respondents rate this positively, which is notably higher than the global average of 60 percent. Overall job satisfaction in Melbourne is also above average, with 71 percent rating this factor positively. Expats also find that there is an abundance of leisure options for their time off from work: an astounding 91 percent rate this aspect positively, 19 percentage points higher than the global average of 72 percent. The satisfaction with work-life balance and the great leisure options are accompanied by glorious weather: 75 percent of the expats living in Melbourne rate the local climate positively. Melbourne ranks highly in the Ease of Settling In Index, too, placing fifth. Melbourne also ranks fifth for feeling welcome and fourth for friendliness. The warm welcome in this city down under is not surprising as more than seven out of ten of expats living in Australia (71 percent) say they are happy with the friendly attitude towards foreign residents. Melbourne does even better than the country as a whole in this respect with an impressive 83 percent of expats appreciating the friendly attitude towards foreigners. Houston, Texas, finds itself in second place overall and for general satisfaction among expats. The United States of America's fourth-biggest city also excels when it comes to the cost of living and personal finance, ranking fifth and seventh, respectively, in both of these categories. Houston comes in first place in the Ease of Settling In Index, too. However, the data was collected before the US presidential elections: it is yet to be seen if the election results will have an impact on such ranking categories as "Friendliness" or "Feeling Welcome", which the Ease of Settling In Index is based on. Madrid ranks third overall, mainly due to expats feeling welcome there and finding it easy to make friends: the Spanish capital takes the top spot in both of these categories. Madrid is also appreciated for its comparatively low cost of living: 72 percent of expats rate this factor positively, in comparison to the 49 percent global average. 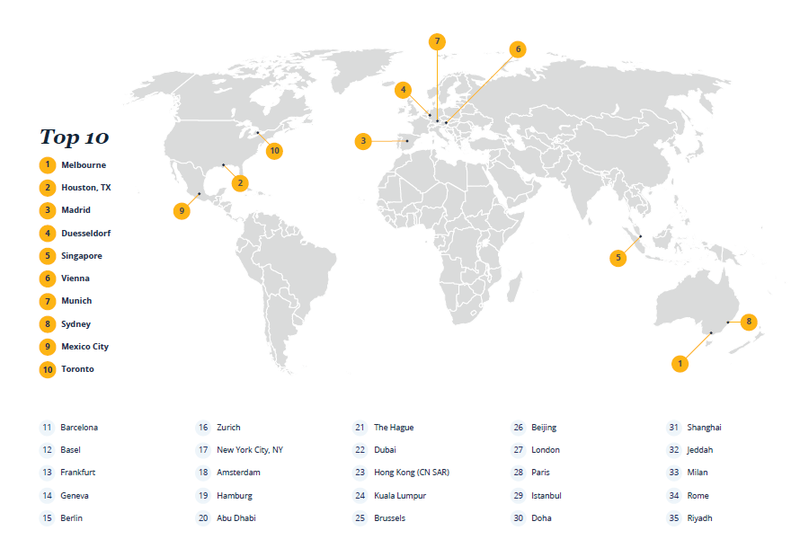 Duesseldorf comes in fourth overall and takes the second place in the Working Abroad Index. This city in the German Rhineland also ranks second in the Work-Life Balance subcategory. In fact, 75 percent rate this factor positively, which is notably higher than the 60 percent global average. Expats are also particularly pleased with their job security in Duesseldorf. This is in part due to satisfaction with the state of the economy: not a single respondent in Duesseldorf rated this negatively. Singapore makes it easy for foreign residents to explore, coming in third in the Travel and Transport subcategory. An astounding 97 percent of expats in Singapore rate the opportunity to travel positively and 96 percent feel equally positive about the transport infrastructure, significantly above the global averages of 79 percent and 64 percent. Expats will not have to worry while traveling around Singapore: it ranks first overall in the Safety subcategory. The Austrian capital narrowly misses the top five, but the Vienna should not be overlooked: it ranks first for quality of life, health, and travel and transport. Expats living in Vienna do not need to worry about the quality of the environment affecting their health. An overwhelming 96 percent rate this factor positively, in stark contrast to the 67 percent global average. While Barcelona is more on par with the global average when it comes to the quality of the environment, this does not stop expats from enjoying their leisure time. Barcelona ranks first in this subcategory, with an astounding 95 percent saying they are satisfied with the availability of leisure activities in general. Of those, 60 percent even say it is 'very good', double the global average of 30 percent. Mexico City ranks first in the Friendliness subcategory: 90 percent of respondents rate the general friendliness of the local population favorably, with 33 percent even saying it is 'very good'. Berlin on the other hand, does not do so well when it comes to friendliness, but it is at the top of the chart for cost of living. In fact, 76 percent of expats feel positively about this, a notable difference from the 49 percent global average. While Berlin is great for those on a budget, Beijing is the best place for those concerned with personal finance. The Chinese capital makes it to first place worldwide in the Personal Finance Index, with 72 percent saying their disposable income is more than enough to cover everything they need in their daily life, compared to the global average of 48 percent.